Sorry to double post, I just wanna bump the thread ya understand. Let me know if you all don't want me posting pics of Gary/Kyle since it's not technically a thunk thread but, well, I can't help it. 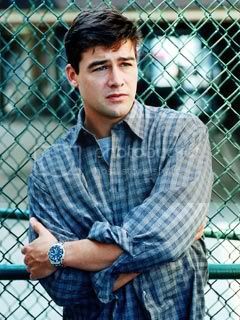 Also, I'm not sure how well a Gary Hobson/Kyle Chandler thunk thread would go over or, even where to put such a thread. Which is why I've only posted a few small-ish Early Edition pics. Except maybe for the first pic...not sure what/where that's from. Again, let me know. I won't be offended...much. Okay, off to watch my nightly episode of Early Edition. I like the pics, thank you for posting them. They are great. 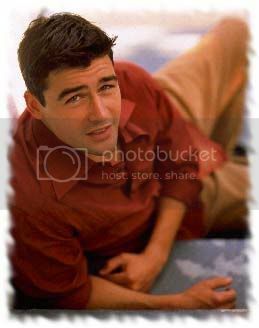 I don't think I'd participate in a Kyle Chandler thunk thread; I agree that he is handsome and cute and nice to look at but I thunk only one man (see avi and siggie), LOL. Fortunately the show was so much more than a good-looking actor. The story was unique, interesting, and the characters were really great, 3-dimensional. It didn't get boring like many other TV shows, although I do think that it was much darker in the later seasons if you know what I mean; it had less humor after Chuck left. In other threads I saw that people are doing rewatches like watching one episode each week and then they talk about that epi, what they liked in it and what they didn't. What do you think about it? In the Men Of Letters bunker. Your welcome. Maybe I'll stick to posting pics of the cast now and then. Not just one character. Heh, no problem. I thunk two men...officially. The first one is obvious, the second one is Jensen Ackles from Supernatural. I'm just gettin' back into that show. Yes, there's more to Early Edition then the pretty faces. And I agree that it got darker towards the end of the series...not so light and fluffy. Either way is fine with me though. I think that is a brilliant idea! I rewatch one episode every night as it is, it's perfect! Sorry for the belated answer, I was without internet for a few days. Great! Then I think we should start with the Pilot episode. I loved it and it captured my attention immediately. The idea was interesting and I think the actors found their characters from the start. I liked that we saw that Gary is the perfect man for the job, so to speak, because he didn't use the newspaper for selfish purposes, like he gave all the money he won at the horse race to Marissa. It showed that he has a big heart. I like the 'cat as postman' idea. What I did not understand was why his wife throw his things out of the window. I don't remember if it was ever explained. I thought it was a bit extreme and theatrical if she did it only because she didn't love him any more. I'd like to hear what everyone thinks about it. I hope more people would find this thread and post here. you can count me in as a fan of the show, you can catch some of it on you tube. .....and me! I watched it when it first aired and loved it. For a long time whenever I mentioned this show no one had heard of it so it's nice to see I'm not alone either with liking it! I found it on Netflix last year and rewatched the whole series in a week! It was just as much fun to watch again as the first time. I liked all the characters, especially the cat! It was nice to see a show with a kind hearted amiable guy trying to help others. one of my favorite scenes is when chuck comes back in to garys life and the news paper arrives and the cat freaks out, gary runs to the door, but the cat won't let him near it and when he eventually does, there is gary on the front page about him getting the future news paper then the paper goes blank, that is one I can't forget. Fond memories of this show when it was on air. Really want to watch it all from the beginning soon. I'd like to get the dvds but I think only seasons 1 and 2 are only ones available. well the good news is that yes season 3-4 is out on dvd, but the bad news is I don't know about this place, I found the link to it on amazon, so it should be legit, but you take your chances. For me, while it was an ok show, i never got interested in watching it all the way from start to finish. I loved this show, but it wasn't just the same once Fisher Stevens left it and they brought in Kristy Swanson and the kid. Fisher's character was easily the best thing about the show, but that's not why I watched it. I loved the plot of the show, which was and still is unique (unless someone decides to do a new version, with people getting Facebook news or Twitters a day before something happens). And looks like you predicted God Friended Me in 2010. Actually God Friended Me is just a remake of Person of Interest but without the terrorists, the knee capping and other violence scenes. They even got a similar set up. Also a fan of Early Edition... at least early on. Not sure how far I ended up watching any more, but probably at least the first season. As for a different take.. There was Tru Calling, which had a very similar vibe to this show, staring Eliza Dushku in 2003/4. Instead of a newspaper, she simply was caught in a groundhog day scenario - resetting over and over, and having to fix things until the universe was happy. "How Doomsday Should Have Ended!" • "Bigger on the Inside?" • "The Doctor Falls - With Hartnell!" Hi. New member here. ???? Anybody here from Earlydues old Early Edition Forum? We had sooo much fun together. I met lots of people and made lots of friends there. ??? ?